Once again, the path took us to a small Karstic village near the Italian border, Vojščica. This time we joined an organized Sage hike 2019, which was already 13th in a row. Local Community Vojščica organized the first one far back in the year 2007, but three years ago, the organization of the hike was handed over to newly established Sport-Cultural-Tourist Society Farjovca, which takes care of the village development. First, we must know from where did the name come from? Part of the route of the hike takes us along the slopes of Grmada, where on the rocky ridge of this elevation grows the plantations of sage. In a time of the hike, spring, sage is just in the initial stage of flowering and it smells incredible, which always takes over the hikers. And for sure it did, the sight on sage was just beautiful, and it was fulfilled with the unique view to the surroundings. At the same time, wild asparagus was seen through the whole route of the hike. As it grows high and mighty above the karst slopes. Many of the hikers were like small children running for their candy, to gather asparagus. As all the hikes in Vojščica, this too started in front of the former village school and a trained tourist guide, who also provided some information’s about sight we saw along the path, led it. As mentioned, we gathered around the school, where everyone could pay their contribution for the hike, it included snacks and lunch at the end, and of course, homemade aperitif. We arrived just a few minutes before 9. in the morning, took time to relax and prepare for the hike. After half an hour, the organizer gave us some information and pointers about the hike, the plan and some other info necessary to know. With that, we were on our way of around 10 kilometers long hike. The weather was little a bit sour, but this did not discourage around 200 hikers, who took part. In addition, there were even some from Italy and other places around Slovenia. All ready for a four-hour walk around Karst. We preferred the weather as it was, as in summer it can get very hot on Karst, and there is not much shadow to be seen, because the trees are fairly small. So, we passed the local church, some steps on the road and turn to the left on the macadam road. We already could see a typical Karst landscape, with a lot of stones and stone walls. At this point, we must compliment the organizers, as the entire route was well marked with arrows and other signs. Not that we needed them, but anyway it was nice to know you will not get lost. This time many dogs joined the hike, and it always funny to see a little lost dog, standing at the side or running up and down, trying to find their owner, and their happiness when they succeed. The path took us around all the Karst beauties, rocky slopes, pine forest, meadows, pastures, karstic hollows, and other sights. First World War also marked Karst, as you can find many war places, like caverns, grenade holes, water tanks, shells and other things. This was a dark part of history, and in this part of Slovenia major battles occurred on Soča front. In that regard, both sides built offensive and defensive trenches for soldiers and their equipment. But let’s leave this behind and go back to our hike. After we came out of the forest, nice view opened on the surrounding hills and landscape. Here we turned right on pasture, probably for the goats. In the middle of pasture was an iron manger with hay. Something you cannot see every day or almost never. Around Slovenia, we usually see wooden ones, so this one was something new for us. It was also peeved with rocks and small trees. Soon we passed a typical Karst house, all from rocks and with embedded roof tiles. Because the weather on Karst can be windy and fierce and can take the roof with. Just behind the house, we could see cactus planted in a stone wall and of course, for the coastal area, the typical olive trees. This was a small village, named Vale, which is located in the basin, where Karst plateau descends towards the sea. South to the village is Italian border, on the north elevation Tabor. Here was a military hospital for Austro-Hungarian soldiers, today only the stairs and remains of the kitchen are preserved. Soon after the village path took us to a small Karst path, between stone walls, also used for grazing animals. We could see horses and donkeys, a pair stood on our way. But they were not scared and they let them self to be stroked. Coming out of the forest, the path took us on a bigger macadam road. A few minutes later we could already hear the sound of the accordion, which meant only one thing. A stop. 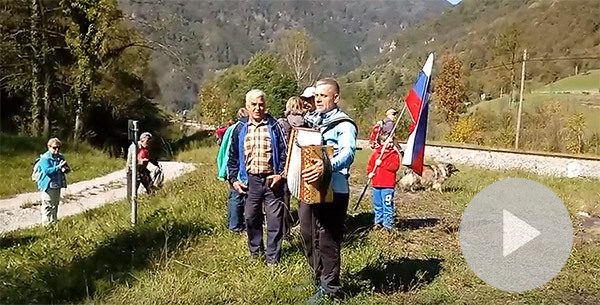 The accordion player was the same as last time, on an Autumn hike on Trstelj (Trail-blog post). He was very lively playing the tunes, and singing along. It really spiced up the atmosphere. Here we got a sandwich and juice, so everyone could get some energy for the rest of the walk. After around 15 minutes, we continued along macadam road back to the forest and towards the slopes where the sage grows. Once we got there it was a really nice sight, we have never before seen something like this. The view on surroundings made it even more beautiful. As the weather was clear, we could see all the way to Italy and the Italian sea. From this slope, we also had a view on Brestovica pri Komnu and other hills around. Very wide and open landscape. There was some more ascent in front of us, but soon we reached the cave with three names – Brstovci, Trščica, and Greščica. 20 meters deep cave with a cone in the middle. Here we got a really nice surprise by the organizer, one of them is a member of Cave Society Temnica, so two of their members came to show how they climb in and out of such caves. One member talked about equipment, their Society and other facts about the cave. It was nice of them to prepare a short demonstration. Afterward, the path led us forward on the Karst landscape. At this point we were pleased that there was no sun, otherwise, it would be wary hot with no proper shadow. Soon, we turned a little off the road to see Hungarian caverns. It was built in the years 1916 and 1917 by Russian prisoners and was intended for Hungarian soldiers. The organizer placed three torches inside the cavern, so we could see how it was made. It could really be scary in these caves, even without considering how it was during the bombardment. After seeing the cavern we went back on the path we came from, in the beginning, we were not sure if this is the right way. So the group we were with stopped at the intersection not far away. We waited for someone to come and appoint us to the right direction. It was just a short break we used to drink some water. Soon we were back on the road again, walking our final kilometers. 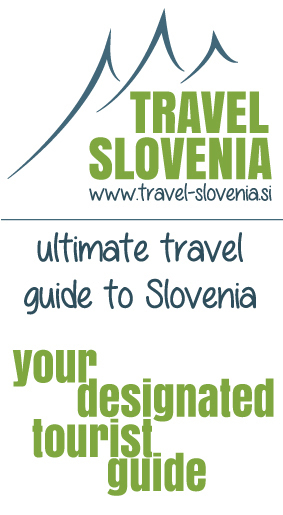 However, before the end, we had one more stop, where we got already mentioned aperitif and Slovene rustic dish. An egg dish, which is known primarily in Primorska cuisine, called frtalja, Italian Frittata. Frtalja is simple independent food, with herbs, vegetables or dried meat. Frtalja is usually made with fennel, at this stop, we had it with asparagus. In addition to frtalja, we also had a glass of domestic wine. Both were delicious. There was also other food made from asparagus we tried and was also very good. Of course, it is imperative that the accordion player is not missing. So we had good Slovenian music and nice tunes while enjoying our frtalja and wine or juice. At this stop we all gathered, so we could continue all at the same time. This day was not just the day of the hike, but also the day of a rally. And on the road not far, which we crossed, they drove their steel horses. As we heard, the race was stopped for us, so we could continue safely. And we knew we are not far from the end, we walked a little faster. Still, do not know, was it because the end of the hike was near or just because the road pushed us forward. Soon we reached the first house of the village Vojščica, passed the periphery of the village towards the center. When we came to the finish, not much people where there, which meant only one thing. We were among the first to come to the finish. We used this and quickly stepped in the line to get our lunch. First thing, we saw once we came to the end, was a bottle of domestic red and white wine on the tables. After eating our lunch, we also tried them both, and as wine enthusiasts, we were impressed. They tasted so good, so we had to take some with us. And while enjoying our food and drinks, we listened to fine tunes of accordion and Slovenian songs. After some time of relaxation, they prepared a small celebration. To search the youngest and the oldest person of the hike, who received a small prize. After that, a short quiz was prepared. Light questions about the information we got along the hike and the correct answer earned the prize. Then the fun began again with nice music and singing. At this point, people started to leave, soon after the rain started and this was a sign for us to leave. We used this opportunity and drove to Brestovica pri Komnu to check the Asparagus day, which lasted from the morning. We came when it was coming towards the end, but still, we saw many dishes from asparagus. It was really nice to see that, we tried some champagne and bought some dried tomatoes in extra olive oil, smoked tomato and smoked tomatoes with malicans. We tried something new, and it was wary good. We had to take some with us. And with that our day at Primorska ended. We had some more driving in front of us, before coming home. This was one more day well spent; it was nice from the very beginning to the very end. At this occasion, we must compliment the organizer for a well-organized hike, to insist and create new stories. Stories like this, we will always keep in our memory. And this is why we always come back, to be part of such events. For the end, we would like to invite you to check the entire route of the hike on Sports-Tracker, photos below or follow our stories on Instagram. We would also be grateful for any share of this or other posts. In search of new trails.